I'm 99.9% sure that I am not the only one that has been more then intrigued by Kylie Jenner and her most recent venture into the cosmetics industry... Introducing us to the Kylie Lip Kit's. 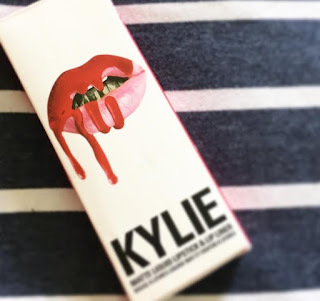 With 8 matte's, 3 metallics and 3 glosses selling out once a week or two - Kylie has dominated the liquid lipstick world since the first minute of her launch. Being in England, its not so easy to get your hands on... Well it is, but you'll need to pay the $15-ish shipping fee's and then spend 10 days praying you've not also been charged a customs fee! Its a bit stressful, stressful but worth it. So worth it. Ordering these bad boys can be tricky. You need to be on the ball and have your card details to hand! I tried the day of the launch, the next restock, the restock after that, and every one since. They sell out in about 5 minutes, so you've got to be quick! When I finally got through, the rush of glee the came over me was almost enough to knock me off my feet! Although she's made 8 different original matte shades, there's only 5 I've had my eye on - the others are to dark and I'll look like a walking zombie. They're gorgeous shades! I just wouldn't do them any justice. So is it worth all the faffing around for a piece of makeup? 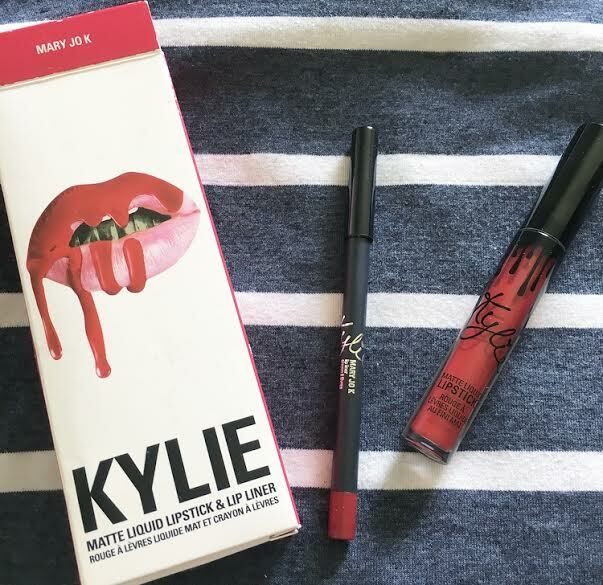 Each lip kit is packaged in a standard box. Decorated with an effective pair of lips, colour running down them, grill in tact. I admit, the first time I saw the packaging, it caught my eye and I loved it, its different to everything else on the market, with a creative edge. Each box contains 1 lip liner and 1 liquid lipstick... pretty standard. The products them selves are gorgeous. 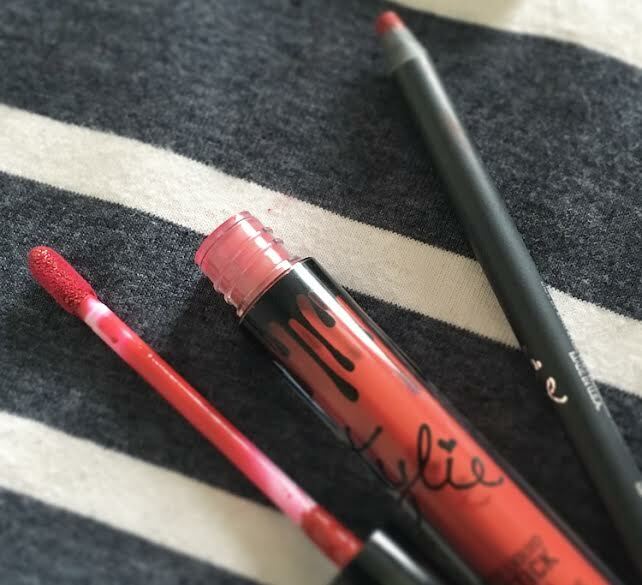 The lip liner is a sleek black design with Kylie's signature. Its easy to sharpen and the creamy texture makes it easy to work with. As for the liquid lipstick? Wow. Can I just say... Is this meant to smell of strawberry's and cream? Because it does, and it sells itself to me. I've heard others describing the scent of cake and frosting, but that wasnt what I got. The bottle is so effective, glass with a sleek dripping motif running down in. The colours pair together beautifully. OK, as mentioned the lip liner formula (left) is really creamy, making it super easy to work with. You don't need to apply any pressure for coloue pay off and you don't find your self worrying its gonna need sharpening every day! If you wanted, you could wear the liner on its own, its soooo pigmented. The liquid lipstick is the same, I do feel like a little goes a long way but you may need 2 coats to avoid it looking patchy (I've heard this is only really the case with Mary Jo K). I did find that when I swatched this, it took a while to dry. But that's not a huge big deal, for me personally. The only downfall, is, it's quite drying on the actual lips... BUT, its a matte liquid lipstick, what does everyone really expect? I know Kylie puts a lot of effort into improving her formula's regularly, but I don't think anyone will really over come this issue. Weather it be Kylie, Coloupop or Mac. So, was it worth it? Yes. Don't get me wrong, the price is a bit on the mental side of life. But if you've got one, you know how good it feels. However, its not worth spending 10000 on eBay for one! If you like the colours but not the price, why not try out the alternative shades from different brands such as Colourpop? You're not gonna get the same quality as the Lip Kits, but you will find near enough the same colours! I am 100% going to look out for the next restock so I can pick up a few more colours, and possibly the glosses! I don't think the metals would work for me! Please let me know your thoughts in the comments below! Or feel free to share recommendations of other liquid lipsticks! I prefer ABH to Colourpop but I am partial to both!